Every day of cycling brings its own little challenge, whether it’s a particularly long or steep incline, a sat nav malfunction, a sore bum, painful legs, or trouble finding food and a place to stay for the night. Most days we just grit our teeth and beast through the pain, but today was unlike most days. In hindsight, it was actually a great day: it was a Tuesday and we weren’t stuck working in an office, there were no chores to do, no bills to pay, the sun was beating down and we were cycling about France without a care in the world. But, for me, it was my least favourite day of the trip so far. It started off well enough. 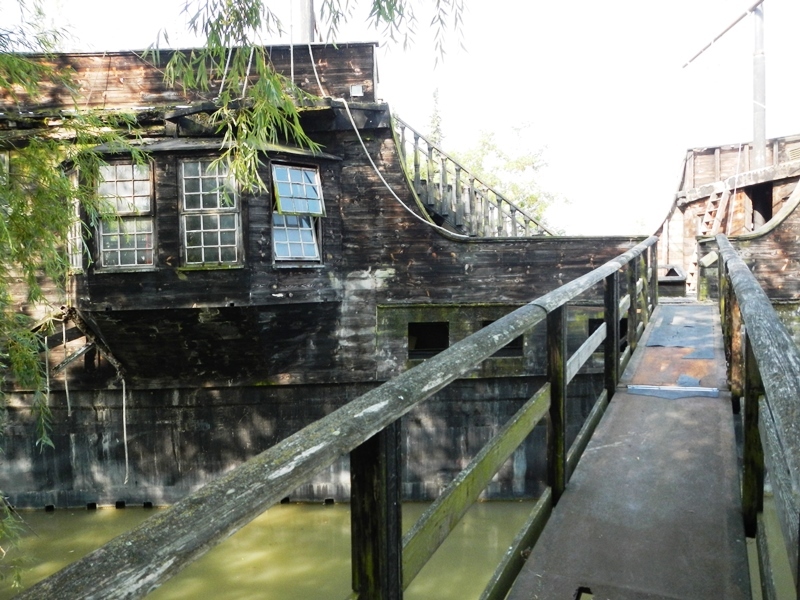 Setting off from Dayme, we cycled past this awesome abandoned house-come-pirate ship. We decided to explore it a bit more, but after seeing Nev walk just a few steps onto the ‘plank’ ahead of me and then slowly reverse, rusted metal crumbling under his feet with each step, we agreed it was probably best observed from dry land. Back on the canal, we overtook many, many other cyclists and were doing pretty well for time but my quads were starting to get a bit tender so we decided we’d make a short day of it and stop somewhere for a rest day. We’d picked up a map of the canal route from the tourist office and could see a little place called Belflou, just off the canal, which had a lake and seemed like an ideal place to rest. This is where the day started to become my least favourite. Immediately after leaving the canal, we started going up some pretty steep hills. After the flat easy cycling of the canal, the hills were absolutely killer. My legs were on fire and even singing in my head “o-oo-oah, my legs are on fire…” (to the Kings of Leon song) wasn’t cheering me up anymore. After a while, we got to what I thought was the top. A gorgeous little village but nothing in it but pretty buildings, not even a patisserie! At this point, we probably should have turned back to the canal but, eager as beavers, we continued onwards (and most definitely upwards). We eventually found the lake, which was completely stunning; so beautiful, picturesque and not another soul in sight for miles. An ideal place to relax but there was still no sign of the campsite and, being ruled by my stomach as usual, I was getting concerned about the food situation. It was nearing lunch time and we had no food provisions whatsoever. Eeeek. Putting that to the back of our minds, we persevered. 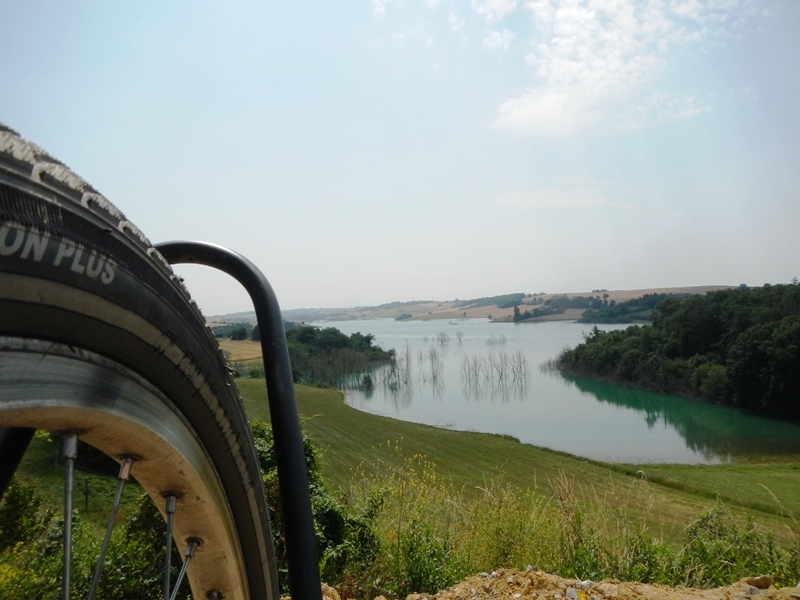 It seemed to be taking forever, not only that but it was also over 35 degrees, the tarmac on the road was melting and cracking as we cycled over it and my positive thinking that the campsite would be just around the next corner was starting to wear thin. Many more fruitless corners and miles later, we arrived at the campsite. It had no shop. We tried the next village too; it was like a (very pretty) ghost town. No food to be had anywhere. Dejected, we sat outside the campsite for a while before we admitted we had chosen poorly and decided the only thing for it was to head back to the canal. I necked some Ibuprofen to try and mask the pain in my legs and we set off again. All in all, it was an almost 2 hour, 20 mile, completely unnecessary and somewhat painful detour. Grrrrr. 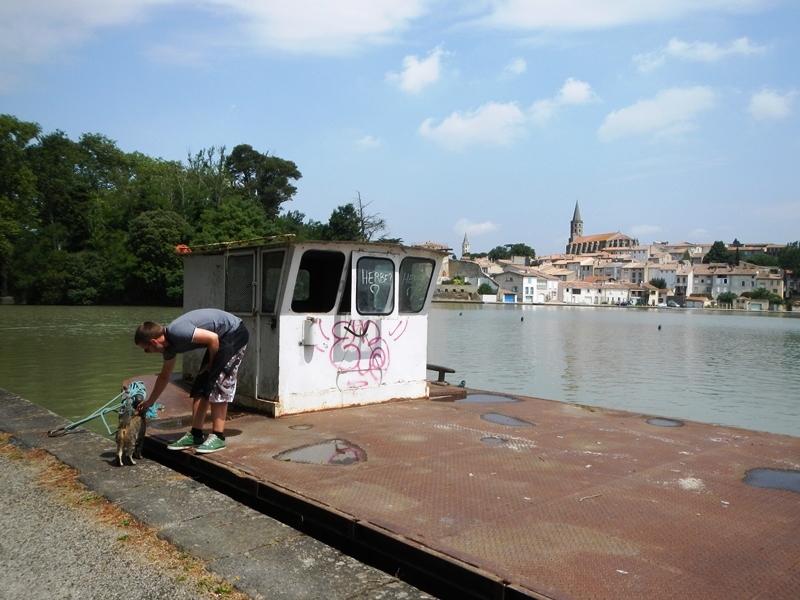 After just 40 miles that day, the town we eventually stopped at for a rest day was Castelnaudary. It was a strange town really. 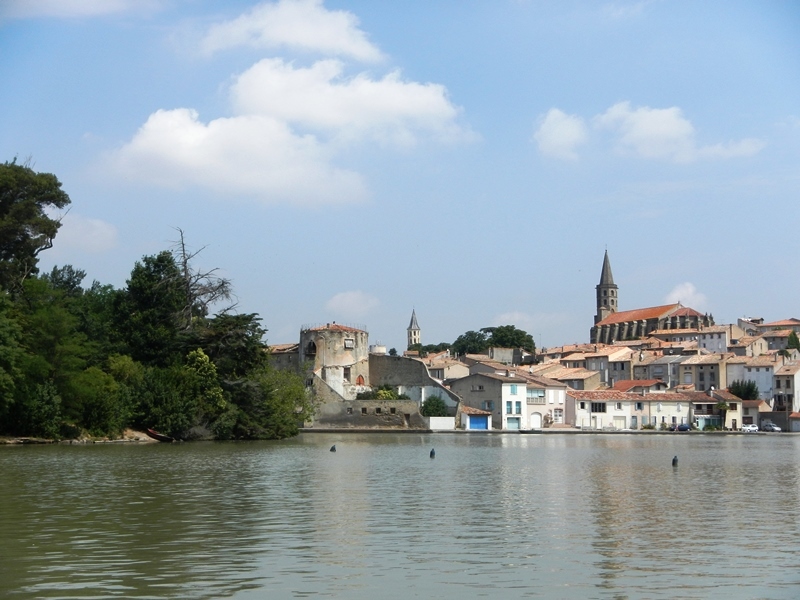 If France was to do a version of Halifax, I think it might look a little bit like Castelnaudary. It was a bit shabby in places (but not in the usual rustic French way), there was a cash for gold shop, some fairly shady looking characters and it was the first time we’d seen actual tramps outside of a city (again, with cats on leads) but it did have some really pretty places hidden away and, instead of a Gregs and a One Pound Bakery, it had a lovely independent patisserie where we tried one of the French specialities – a gallette, which was like a kind of biscuit affair shaped a bit like a croissant, and it made the day seem a whole lot better again. 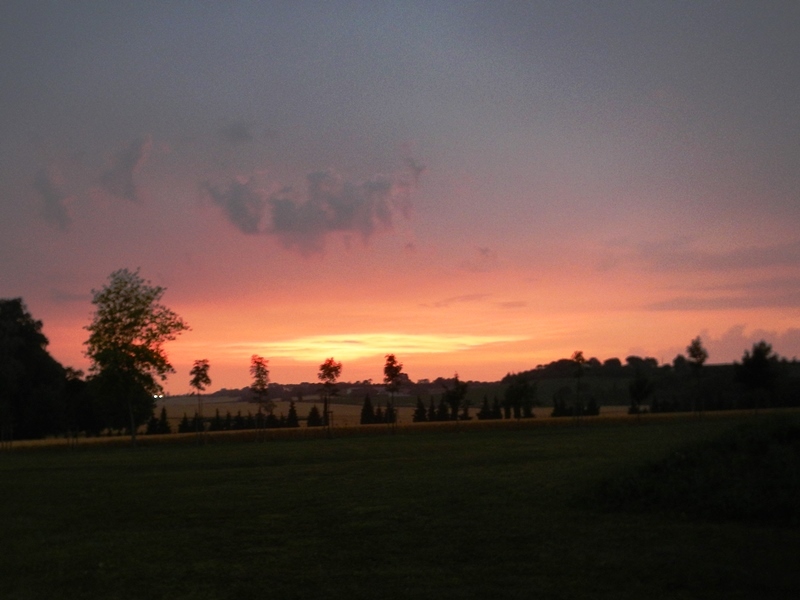 That night, to end the frustrating day in an appropriately angry dramatic fashion, there was a huge storm, so we cuddled up in the tent, read our book and rested our (my) weary legs. 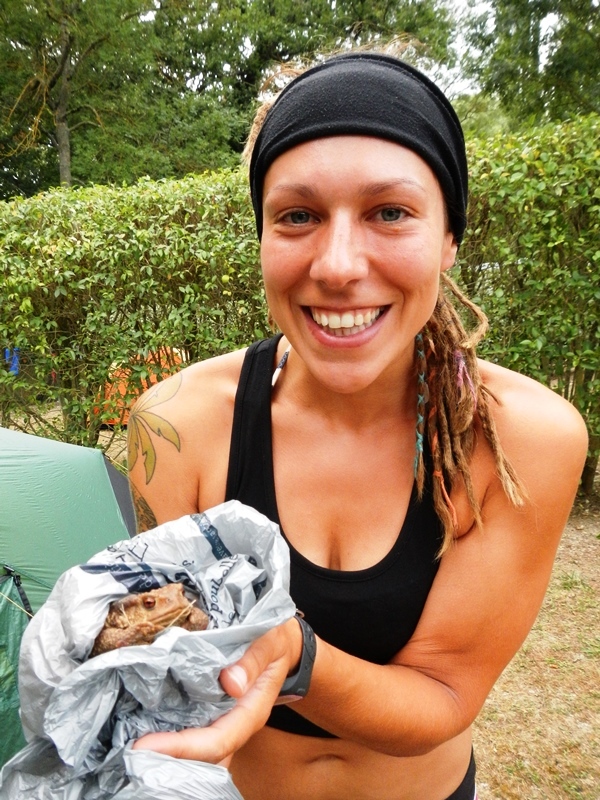 The next morning after brushing my teeth, I started to unzip the tent when I heard Nev whisper from inside “Neola, I think there’s a beast under the tent”. Alarmed, I froze mid-unzipping. “I’ve poked it from in here and I think it might be a frog”, he said. I unpegged one corner of the tent and slowly peeled it back to reveal this unexpected little tent guest hiding underneath. I think it was a toad. It was bloody massive anyway! We spent the day exploring the town and made friends with another cat that followed us around for a while. 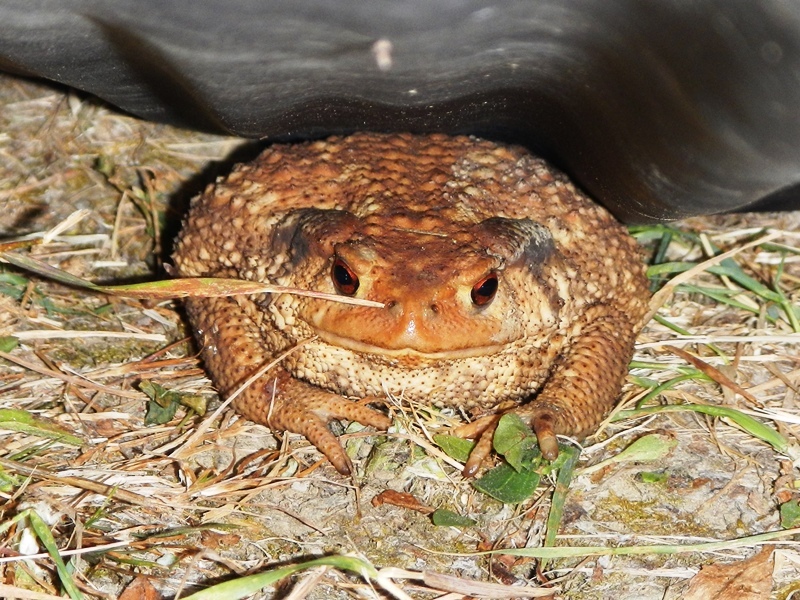 When we got back to the tent later, Toad of Toad Hall was still there, hiding under the tent. We tried squirting water on him but he didn’t even flinch. Eventually, I just picked him up and popped him over the fence. Silly, silly toad. 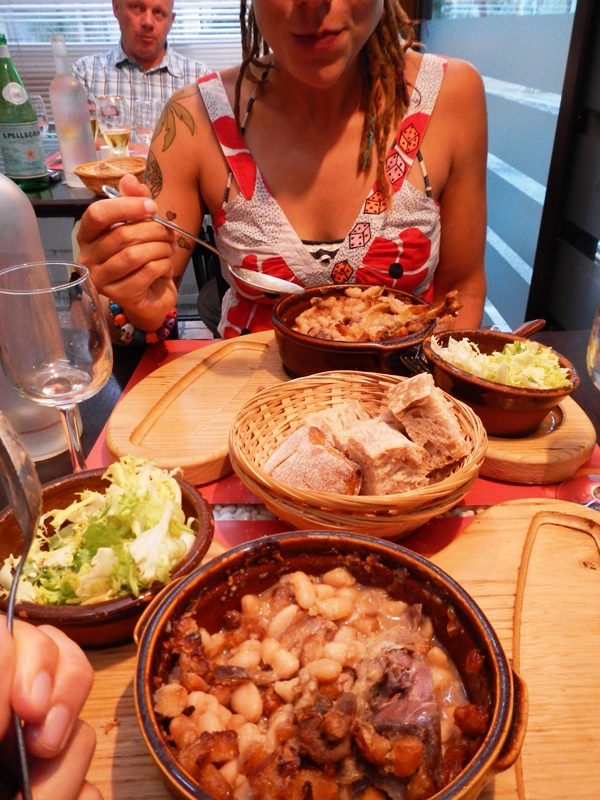 That evening we treated ourselves to a cassoulet, another local speciality dish which is a sort of slow cooked one pot stew with lots of beans, duck and pork. Very tasty and VERY filling! We went to bed that night full of beans and very happy with another storm outside making us feel cosy inside our little toad-free tent home. My goodness, what a mission for food! I take back my advice on venturing away from the canal, stay canal side and eat well whilst looking after those thighs! !